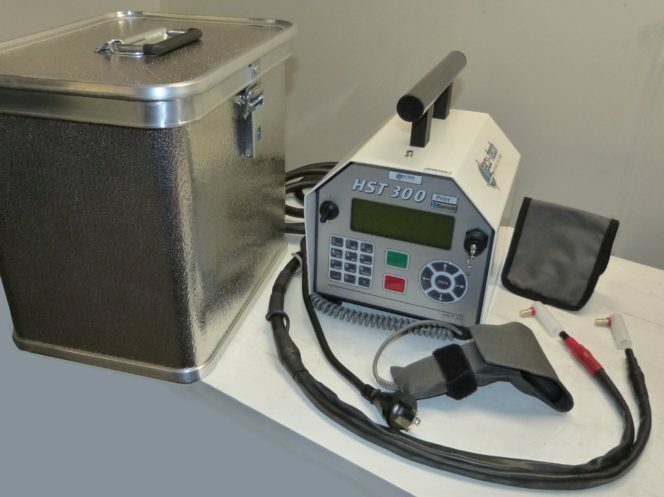 Acu-Tech sells state-of-the-art Electrofusion Welding equipment. 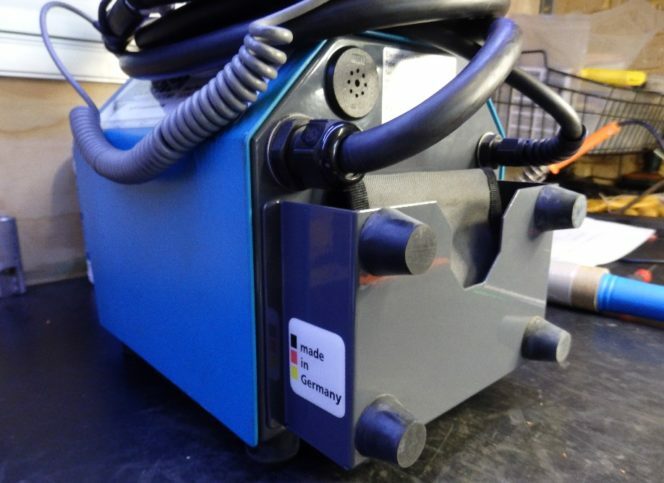 The EF300 Pressure Welder is used for electrofusion jointing pressurised HDPE pipes and fittings for diameters from 20 mm up to 1200 mm diameter. Built to withstand harsh site conditions, the EF300 welder is easy to use, and has large start and stop buttons, colour coded for easy recognition. 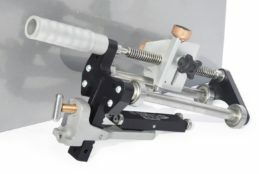 The EF welder is connected to the electrofusion fitting, which heats up, and bonds the fitting to both pipe ends, forming an integral join. 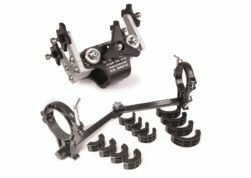 New technology has led to the development of a generation of HDPE welding products that boasts an array of unique and revolutionary features. 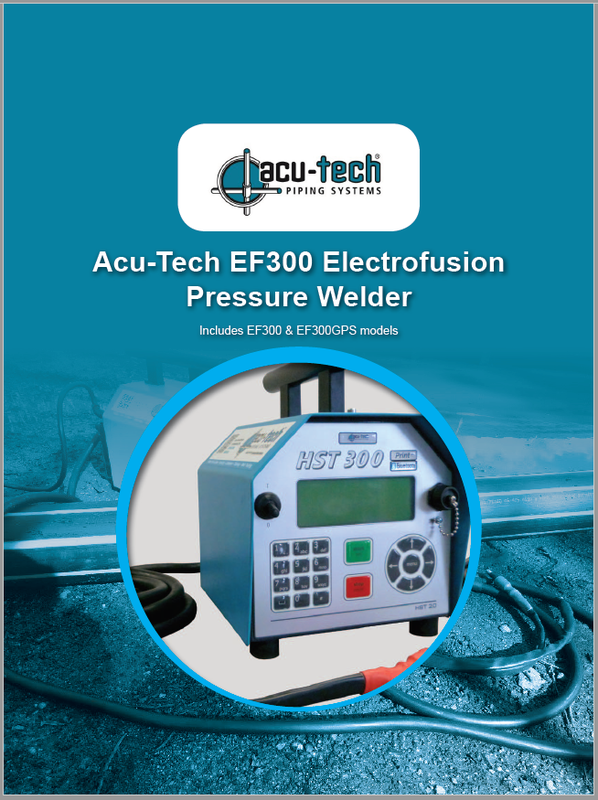 Acu-Tech’s EF300 Pressure Welder has been designed and built by a reputable company in Germany, with the low weight and compact dimensions not compromising the top-notch performance ability and unconditional reliability. If you value your welding operator’s time, the EF300GPS Pressure Welder units have the added feature of on-board geo-data recording at the touch of a button. The EF300GPS has all the features of the standard EF300 welder, but also includes GPS functionality. 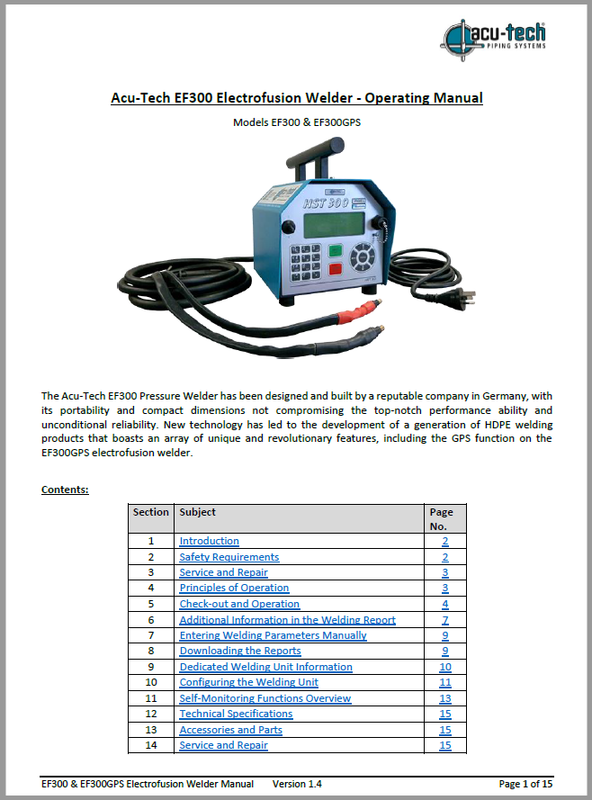 While both models offer an intuitive data download menu that enables the download of welding and traceability data either as an abstract or extended report in PDF format, the EF300GPS Pressure Welder adds the GPS coordinates of the weld to the traceability information. The EF300 Pressure Welder boasts Bluetooth connectivity and scanner functions to reduce welding errors and increase welding speeds. With a state-of-the-art high resolution display screen, the EF300 Welder’s GT keypad offers convenient input of all required welding parameters and traceability data. The alpha-numeric keypad allows up to 65 characters of additional details to be entered. Another unique feature of the EF300 Welder range is the on-board ‘ViewWeld’, which allows the user to view the welding report abstracts on the screen and browse through them, eliminating the need to print the report off to check each joint. 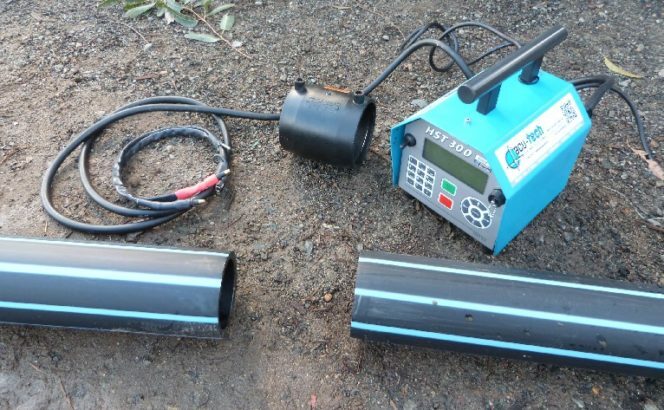 Welding range of diameters up to 1200 mm. 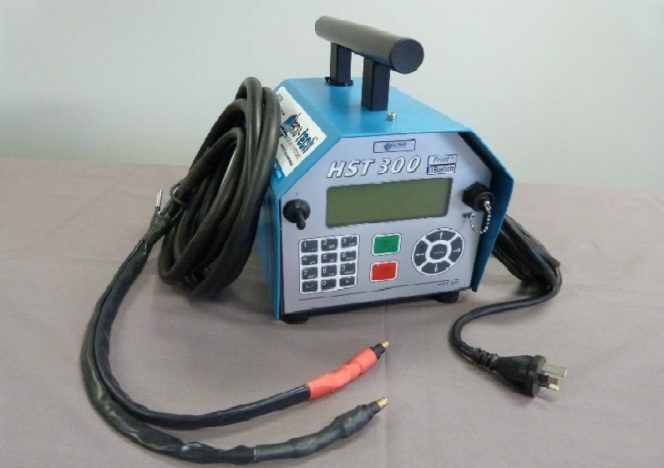 Automatic data logging of 10,000 welding reports. Data can be managed on your phone – via Bluetooth & the ‘WeldTrace’ app. Display screen is visible in the dark and works in extreme temperatures. Easy to use – will sit on its back for better access. 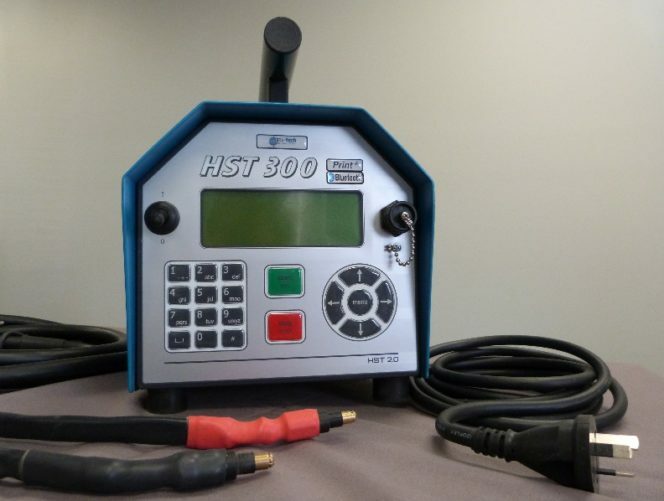 Optional recording of GPS location of each weld (EF300GPS units only). The strong handle also doubles as a cord holder. Highly portable – only weighs 16 Kg. 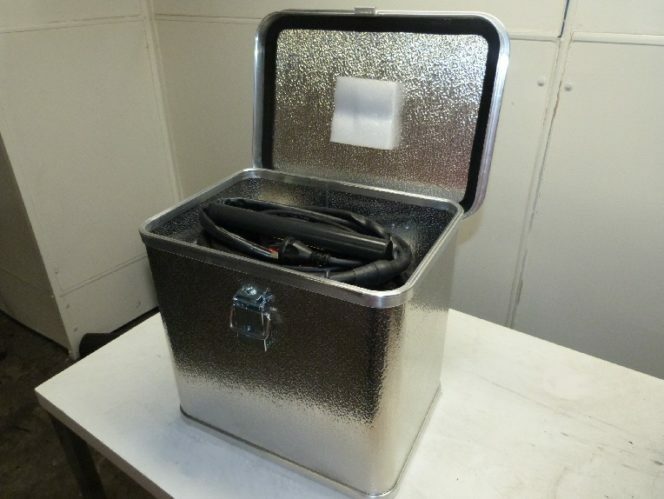 Comes with an aluminium carry case. 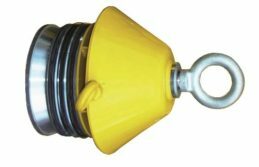 Fitting information can be entered by bar-code, fusamatic pin or manual entry. Welding information can be retrieved on the screen, eliminating the need to print a report. USB connection and Bluetooth connectivity to easily download report data. Multilingual, easy-to-understand interface, with simple colour-coded control buttons. 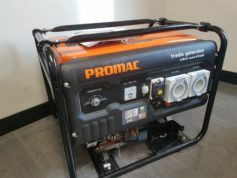 Full Australian maintenance, calibration and repair services by Acu-Tech’s Equipment Department.